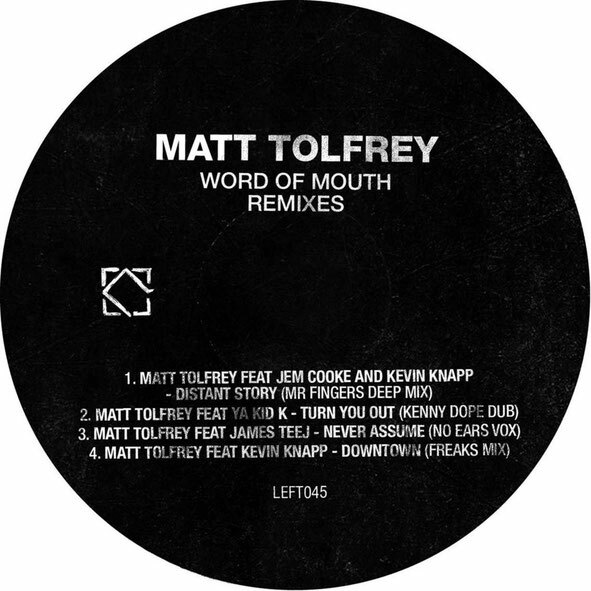 The next release on Leftroom revisits the debut album, ‘Word Of Mouth’, by label boss Matt Tolfrey, which was released in 2012. Four cuts from the full length get remixed by Mr Fingers, NYC’s Kenny Dope, Justin Harris and Luke Solomon’s Freaks project and Classic cohort Rob Mello’s No Ears. 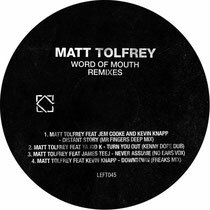 First up, Matt Tolfrey feat Jem Cooke & Kevin Knapp’s ‘Distant Story’ gets remixed by Larry Heard. The Alleviated boss transforms the track into a deeply soulful and spiritual track with otherworldly pads, feathery light hi hats and knock-on-wood beats. Next up, one half of Masters At Work, Kenny Dope, does his thang to ‘Turn You Out’. This one is a skipping, lively jam with crisp percussion and soft edged chord vamps. That unmistakable MAW bounce is buried deep within and the tune builds to a subtle peak over time. Rob Mello’s No Ears Vox of Matt Tolfrey feat James Teej ‘Never Assume’ is a low down growler with a suitably warm and organic dub quotient as well as light footed percussive skip and snaking, bulbous bassline. It’s full of charm and dancing potential before Freaks get a little more late night and after party styled with their remix. It’s off kilter; full of murmuring voices and sharp hi hat slashes and marks a welcome return to the fray for the Freaks duo. The remix package is out 21 April on Leftroom.